The High Tatras or High Tatra Mountains are the smallest alpine type mountain range on the planet with a unique endemic fauna. Among these, one of the most prominent example is Tatra alpine marmot. 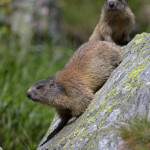 The Tatra alpine marmot (Marmota marmota latirostris) is an endemic subspecies of the Alpine marmot (Marmota marmota). This rodent lives mostly in the area of high altitude clearings and open alpine meadows with rock debris above dwarf mountain pine zone. Their colonies consist of 5 to 15 individuals. It is a stocky rodent of 42 to 84 cm (without tail) in length and weighs up to 8 kg (especially in late autumn when preparing for hibernation). Marmots live in dens excavated using their powerful legs with strong claws. Their senses are well developed, especially sight, hearing, and smell. 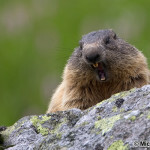 In case of danger, marmots warn their neighbouring area by their typical piercing whistles. Their diet consists of alpine vegetation. Among their predators, there are eagles, foxes and lynxes. Marmots can live up to 15 years. characteristics: Our trip will take us to Tatra National Park (TANAP). The oldes national park in Slovakia, established in 1949, protects the area or Slovakia’s highest mountain range – High Tatra Mountains, which is also the highest part of Carpathian Mountain Range. We will be situated at the altitude of approx. 1250 m, walking in spruce tree, alpine pine and alpine meadow level. Because many parts of the Park suffered from 2004 tempest, we will, between marmot observation, talk also about broader ecological relations of TANAP’s nature. Important notifications and conditions: Participants undertake the trip at their own risk. Tour operator does not provide participants with specific tourist insurance. 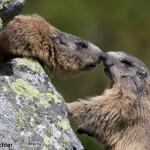 Tour operator provides professional guiding and gear to observe marmots and others. Marmots will be observed only from, or close to, footpaths. Because of their conservation status (endangered species), it is very important NOT to disturb them beyond a very limited level. We do not recommend participants to be accompanied by children below 10 and/or dogs.